Quick Take: The Big Bang Theory, "The 21-Second Excitation"
Review: The Big Bang Theory, "The 21-Second Excitation"
(S0408) The boys spend most of the episode standing in line to see the theatrical re-release of Raiders of the Lost Ark with an additional 21 seconds, and get cut off by Evil Wil Wheaton and his gang, who take up just enough seats that there aren't any left for the gang. Sheldon flips and steals the movie so no one can see it. Meanwhile, Penny, Bernadette and Amy Farrah Fowler have the weirdest slumber party ever, and Amy comes across as something stranger than she was before: not just socially awkward, but actively ignored for much of her childhood, which almost makes her sympathetic. She's just so sincere about the whole thing. And most of this week's jokes are hers so I take back all the stuff I said before about how she was a big rock in the middle of the flow; she's figured out her place. Overall, this wasn't the best ep, and was maybe even a little forgettable, but there was merit in it. Wil Wheaton is always lovely, especially since he so enjoys playing a jerk (which as far as I can tell is not what he's like at all in real life), but he didn't have much to do in this episode and his arrival was almost identical to his arrival in one of the episodes of The Guild that I watched recently, and that confused me for a moment on which show I was actually watching. The pop culture references in my head caved in on each other for a moment, and that's not really Big Bang's fault; we'll blame it on the cold meds I've been living off of this past week. Or three. Leonard, Raj, and Howard had little to do, but they're almost best when they're all just sitting around and talking. The girls were where the progress was made. Amy Farrah Fowler wanted to be included so badly in the girls' night that she got herself invited and then sort of steamrolled the event into a sleepover like she never had as a kid, and her constant checking up on the rules and the expectations of such, via the internet, was sort of charming. She softened up a little, and during Truth or Dare, she got Penny to admit, sort of, that maybe breaking up with Leonard was a bad idea. And she and Bernadette hit it off, it seems. So not a bad ep, but it felt more like a set-up than like an episode unto itself. If we're lucky, Penny's confession will move things along there, and Amy Farrah Fowler will continue to figure out her way into the group -- and maybe she and Bernadette can actually become "BFFs," which would be sweet. It'd be fun if there was a girl-mirror to the boy group, and if the show bounced back and forth between them, instead of Penny having to be the only main female character. As always, super-quotable. If nothing else, this show has that going for it, and it's always amazing. I love that Sheldon is keeping score of how often he catches sarcasm vs how often he misses it, and that it's still very obvious that he usually misses it. 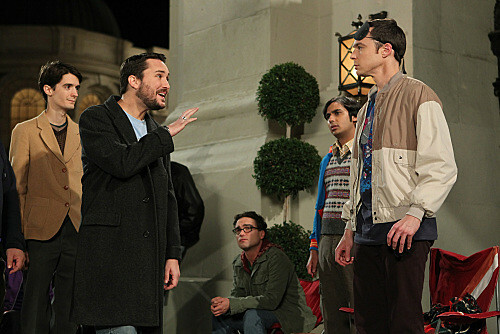 Apparently, during filming, Wil Wheaton tweeted the exact things Sheldon read off from his on-screen persona's account. How's that for blurring reality! Video: The Big Bang Theory, "The 21-Second Excitation"